Our Amish Wooden Chess Set and Checker Board with Drawer is a masterpiece that you and your chess playing buddies will enjoy for a long time. The pullout drawer is perfect for holding the chess pieces so you will never have to go hunting for them again. The raised board also adds a uniqueness to this checker board. This one of a kind checker board will have you playing chess and checkers for hours. This amazing chess and checker board is handcrafted by the Amish right here in the USA. The maple and walnut wood make the black and white squares look very unique. 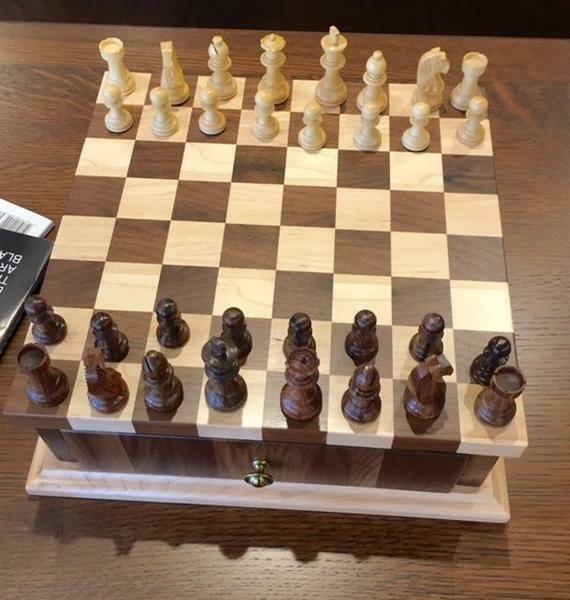 This chess set is so beautiful it can be left out for display for everyone to enjoy. Questions? Call one of our Sales Associates at 1-866-272-6773. Visit our local store in Sarasota, Florida to play a bit of chess with one of our Amish furniture specialists. 13.25" x 13.25" x 4.25"